Adobe just announced that it made the decision to bring Flash for Linux up to sync with Flash for other operating systems. This means that Linux users will have access to the latest Flash releases just like users on other operating systems had for the past four years. While Linux users could use Google Chrome or a comparable browser that ships with its own Flash version, those on Firefox or other browsers had to rely on an old version of Flash, and some command line fu to get it to work. Adobe announced today that it will release Flash Player for Linux in sync with Flash Player for Windows and Mac going forward. If you point your web browser to Adobe Labs, you will notice that the company has reversed its policy on Linux support. 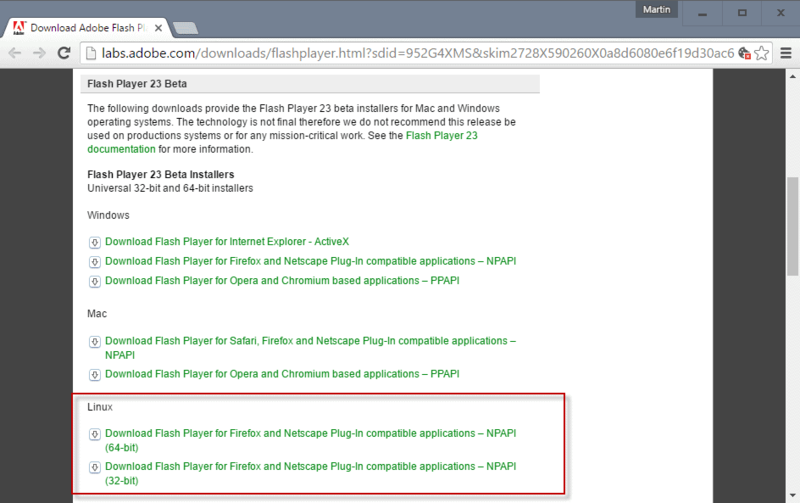 You find downloads for NPAPI plugins listed on the page for Linux that let you download the latest version of Adobe Flash, Flash Player 23 Beta at the time of writing, and install it on Linux. Any browser still supporting NPAPI will pick up Flash Player and integrate it so that Flash content can be accessed while using it. Adobe notes that the security is the motivation behind the change, and that some features won't be fully implemented on Linux. The company mentions GPU 3D acceleration and premium video DRM explicitly. That said, we believe that the new NPAPI build represents a significant step forward in functionality, stability, and security and look forward to hearing your feedback. It recommends to users to use the PPAPI version of Flash Player if that functionality is required. The PPAPI version is integrated in Google Chrome and many Chrome-based browsers, but not in other browsers such as Firefox. The change comes at a time where Flash is on its way out on the Web. Facebook dropped Flash Video in December 2015, Google announced that it would block more Flash content, and Mozilla announced the end of NPAPI plugin support in Firefox. Now You: Do you require Flash? Many embedded videos on Facebook still require Flashplayer. Many video-streaming websites require Flashplayer. Many old videos on Youtube require Flashplayer. Adobe charge annual subscription on website n software developers for using Flashplayer for their videos n video-ads. Whereas HTML5 is totally free for developers n consumers. In 2012, Adobe dropped support for Linux OS for Flashplayer, PDF Reader, etc, likely bc there was insignificant world market share by Linux OS, ie less than 2%, similar to most app developers not making apps for Windows Mobile OS. …….It is not business-wise to support a customer base of less than 2% = lose money. It is mostly tech hobbyists who support a customer base of less than 2%. It’s likely that Adobe hv made this U-turn bc the number of Linux users hv recently increased significantly to more than 2% n rising, mainly bc of the Win 10 debacle, eg many Win 7/8.1 cptrs being auto-upgraded to Win 10 in March 2016, deprecation of Win 7/8.1(eg can’t use the latest SkyLake n KabyLake chips) in order to push their users onto Win 10, Patch Roll-Ups in Oct 2016 to “force” Telemetry updates n other “tricky” updates onto Win 7/8.1, etc. A lot or organization, companies, and governaments use linux today. Adobe does not charge anyone for the use of Flash Player. It’s totally free. where dd U lrn to wrte lik that? do U lso spk lik tht? This move is all about them making $. Plain and simple. Adobe gave up development on Flash a long time ago, yet they know, Flash is still heavily used on the web. Adobe gains nothing out of this. It represents quite some work but the general reason they are doing this is accountability. And the direct goal of the Linux release is indeed improving security. Adobe most likely does or will gain from once again making current releases or versions of Flash Player available for Linux platforms but not direct gains since FP is provided for free. Adobe isn’t a charity organisation. It’s a business enterprise and those work in different ways to try to draw as well as maintain customers, i.e., business, revenues. After all, Adobe has enough for other products, including enough that aren’t free and, therefore, need to be sold/bought. If continuing to refuse to provide free FP for Linux could potentially alienate plenty of customers of other Adobe products is considered a real business risk and providing this free FP helps to maintain those paying customers as well as to gain new ones, then Adobe gains. It’s then an indirect rather than direct gain, but it’s gain and isn’t uncommon in the world of business. Plenty of video providers continue to use FP and some of these people, organisations, businesses, govts, schools, surely purchase some of Adobe’s other products, so it’s in Adobe’s financial interests to not alienate these customers. The Linux user base is growing, not shrinking, so …. Why the need to kick the dead corpse of Flash ? The witch hunt threw web technology at least 5 years back in the past ; and we’re not done catching up in the gaming area, but yes, Flash is now mostly dead. When WebAssembly is ready, then we’ll have caught up. For me Flash is still alive and I hope it keeps alive. Why? When I go to one of my favourite sites I can chose between Flash video and HTML5 video. The flash video preloads the whole video while I am watching. And Flash is set to click to play. Great. HTML5 videos only buffers some seconds and after a while they just stop. That is so annoying. And I have to install an extension to have sth like click to play. Autoplay html5 videos are so annoying. I do not see a security issue if you have click to play enabled. Try disabling Mediasource in about:config by setting media.mediasource.enabled to false. Should disable the “loading by chunks” feature. I view this as legacy support for the future. Do it now and future digital archaeologists will have Flash for their future Unix OS so that they can play their .swf discoveries, like Hangaroo and Crush The Castle. I think there’s even a Flash version of ChuChu Rocket somewhere. Why do you need Flash if it in Google Chrome? Let me tell you that 2-5 years time; it will have security issues. My linux machine does not have Flash nor my Windows one, I boycott sites that require Flash. Flash is already dead on my book. What a severe punishment !! Adobe(C) is fearing HTML5 development, so they “help” linux users by reintroducing the hog plugin known as Flash(TM). Note that there are shell scripts that clean the privacy issues left by using the hog known as Adobe(C) Flash(TM) Plugin. One Big reason (unfortunately) to have Flash available is that numerous web sites still use it for stupidly trivial tasks. Can’t count how many times I’ve switched to Chrome on Linux to view something and it just LAUNCHES A PDF viewer – DIE, DIE LAZY WEB DESIGNER!! Same happens with DRMed media players, many content owners still haven’t moved to one of the HTML5 alternatives. Reportedly there is some popular site visit counter widgets and backend that need Flash :-\. Even though I have pepperflash on my 64 bit systems, the Adobe 32 bit version could come in handy on my old laptop for the above reasons. Just wish Samsung would update 2014-2016TVs with new Chrome browser and this flash update! Martin, you wrote the following in your article. What is “command line fu“? Do you mean “function“? If you do, then “op.“ for “operation“ might be better, for people don’t run functions from the command line. This is p.o.v. from a former software developer and computer science graduate. Also, and from my experience, fn is a rather standard abbreviation for “function“ while fu definitely isn’t. fu could be to mean f*ck. Michel, I think I got it from here: https://xkcd.com/196/ It is short for Command Line Kung Fu, so, doing all kinds of tricks on the command line.